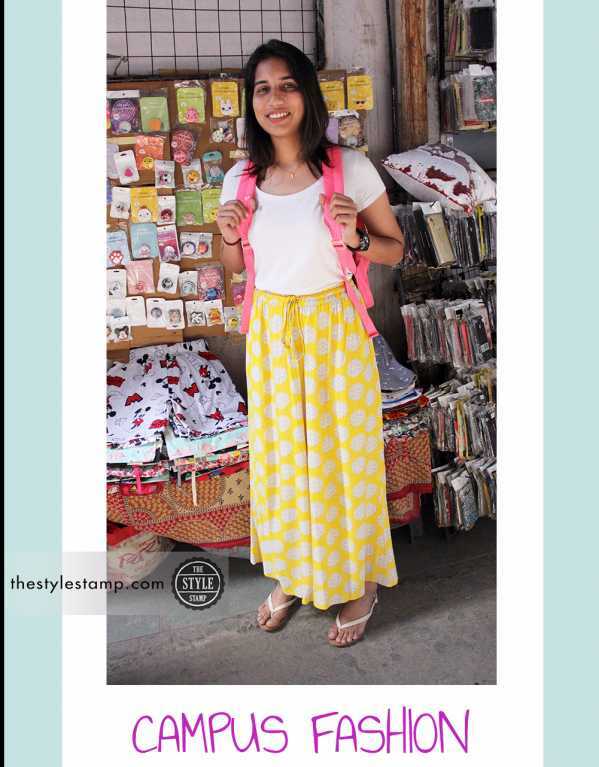 Affordable and Innovative fashion begins at various college campuses. 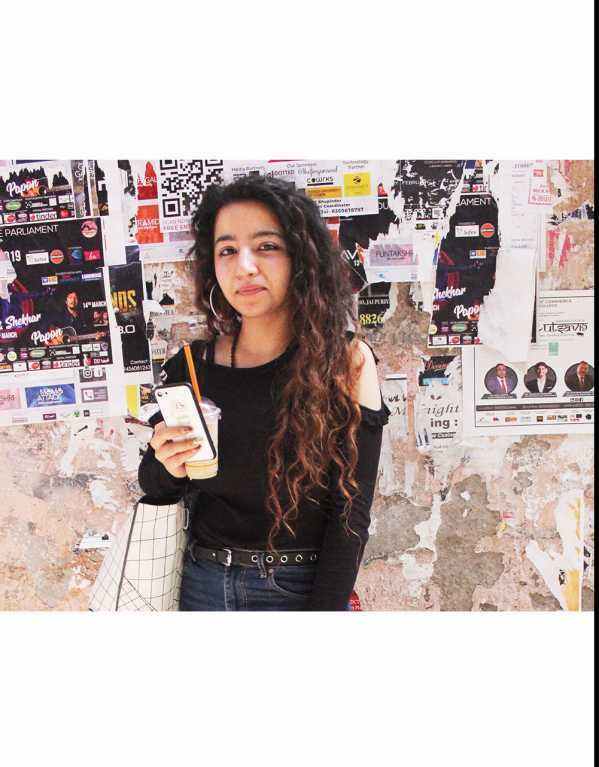 From prints and experimental fabrics to bold and edgy colours, these campus "Fashionistas” know how to rock their look. Mixing and matching different pieces to create an "Insta-perfect” ensemble is perfectly depicted by these enthusiastic youngsters. 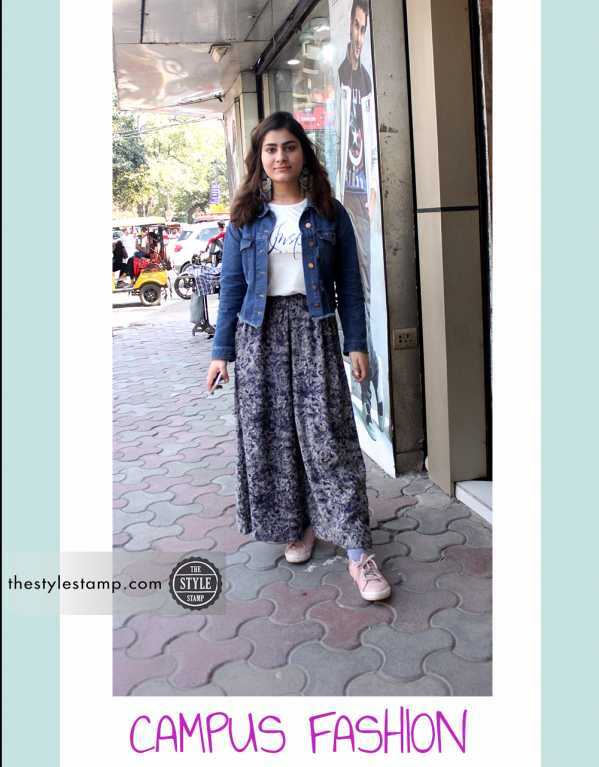 Today, we bring to you the best of style stars on the north campus of delhi university for all your experimental and budget friendly style ideas! 1) Ripped Denim to the Rescue! 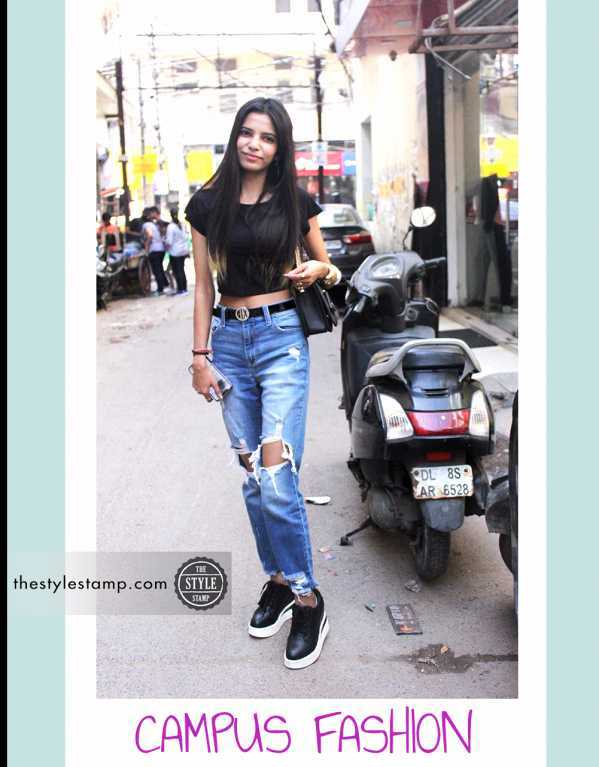 Monochrome crop tops with ripped denims are the classic example of a good "outfit” day! 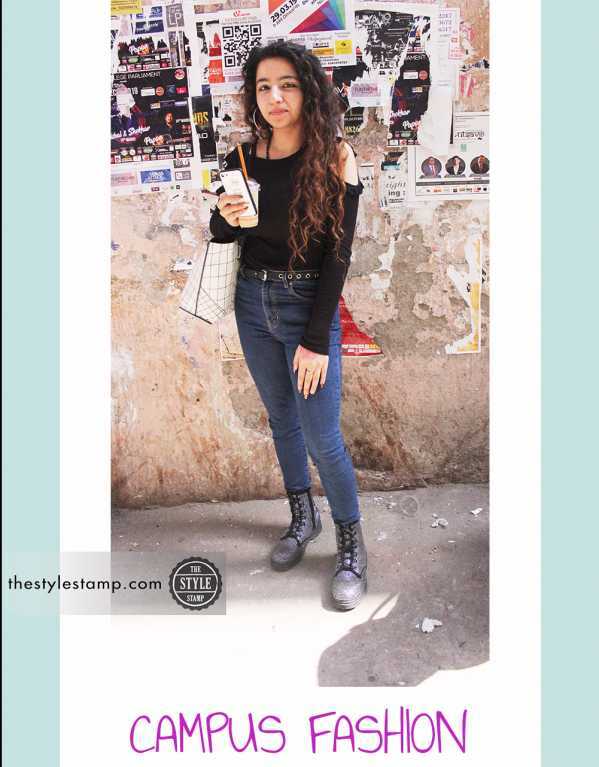 This campus star surely knows how to rock and accessorise staple pieces from our wardrobe. A belt to cinch in the waist and chunky sneakers complete the look. We love how minimal accessorising has been done to keep the look from going overboard! An oversized slogan t-shirt with printed joggers was all it took to convert a basic look into a chic one. We love how the tee has been tucked in to draw attention to the waist. Also that motivating caption on the tee is all that we need to keep going on weekdays! A smart way to cover up from sunburns and tanning in the harsh summer sun. Take a cue from our Campus Star by layering light breathable fabrics. We love how the printed palazzo has been paired with complementary earrings. Keeping a neat and simple hair and skin adds wonderfully to the look. 4) Athleisure on the Go! Take some inspiration and bring out your Athleisure from the gym! We love how the joggers and tee have been used as an everyday wear! A monochrome sneaker and statement cap is the cherry on top of cake! 5) Cold Shoulders are back! This trend has made an impactful comeback! These chic tops show just the right amount of skin without going overboard! We love how it is paired with monochrome boots and a statement handbag. Silver hoops complete the simple yet edgy look. 6) Neon and Polka Dots! These two options are the perfect choice to brighten your mood on a dull day! The pretty pastel polka dotted palazzo is a comfy - summer friendly option. Take some cue and add a dash of neon to your backpack and you are all set to make some heads turn! 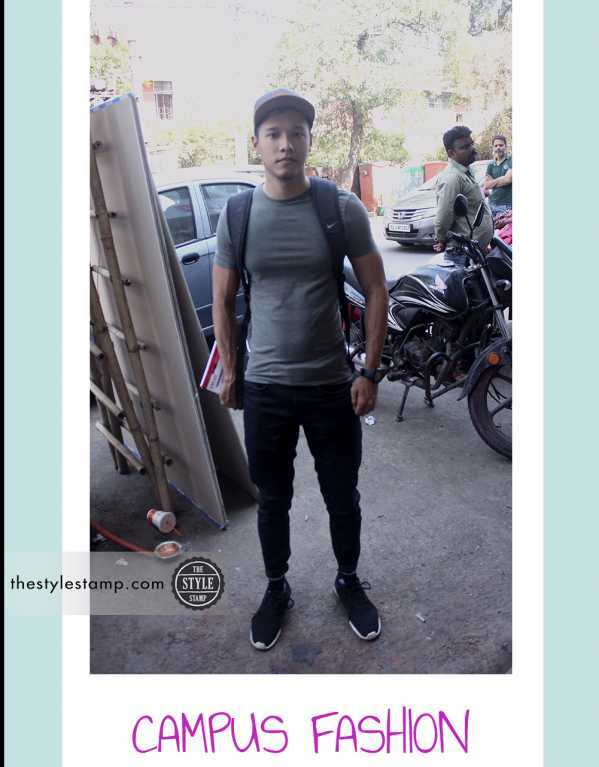 The Style Stars on Campus! From the usual drill of "I have nothing to wear" to finding the perfect piece that fits the bill, it’s the same tiring process everyday, for basically every college goer. It won’t be an understatement if we say, we feel ya! However stepping out looking like a million bucks, every day isn’t an impossible task. Just a tweak here and innovation there, and you’ve got yourself a whole new outfit. For the days when you need some pinterest level inspiration, we are at your service. 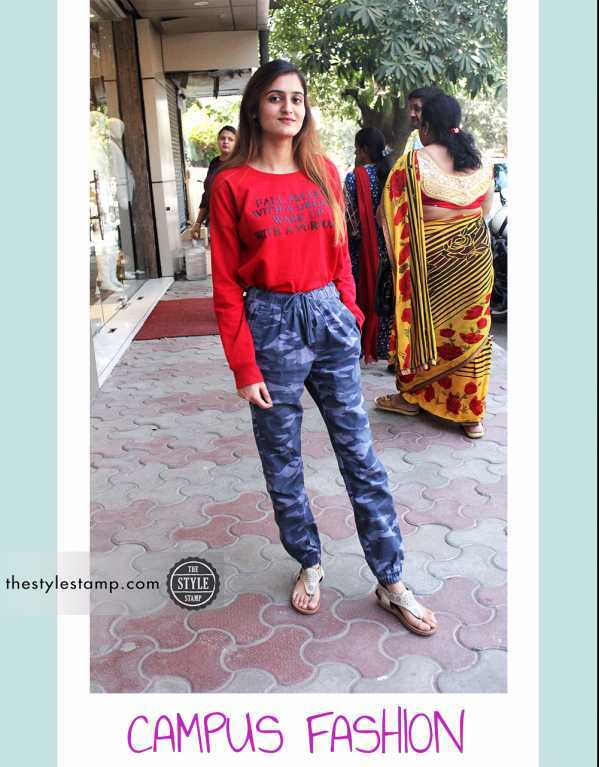 This week’s Campus Fashion has been filled with colourful and bold outfit choices. From stripes and culottes to quirky sunglasses and boots; these "fashionistas” are on fire. 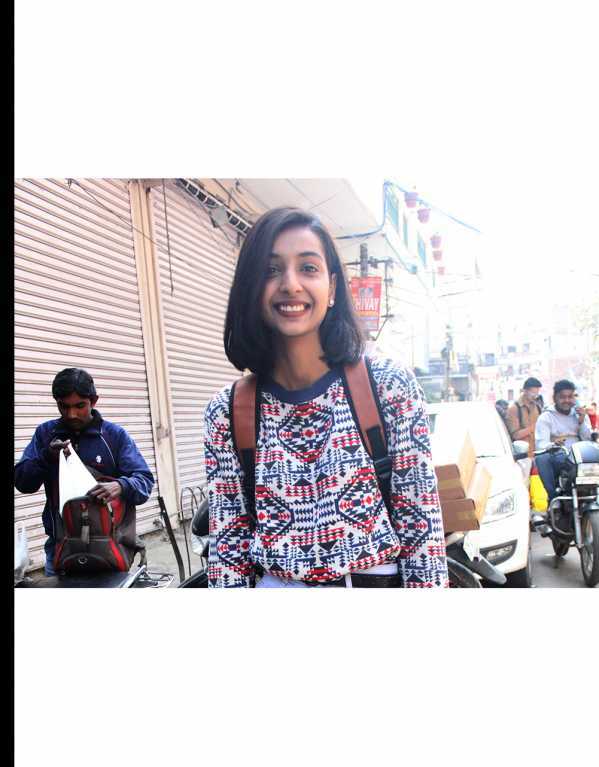 For all the fashion enthusiasts, who brainstorm every morning on their "I have nothing to wear” moments; we bring to you, some fashion inspiration from the Campuses of Delhi. 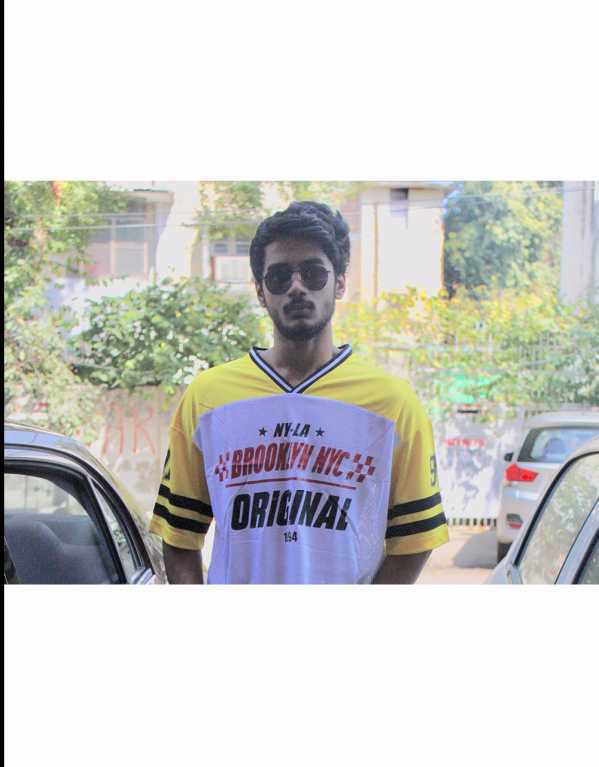 Remeber watching <em>Rahul</em> in<em> Kuch Kuch Hota Hai</em> being the king of cool, playing basketball in his Speedo T-shirts and smoothly getting every girl in college to drool over him? Or <em>Poo</em> in<em> K3G</em>, wearing her perfectly coordinated and accessorized ensembles to class, and picking boys as her prom date? And then remember wanting to fast forward your life to college for all the fun and fashion? Yeap! So did we! We’ve all wanted to live thier reel life in our own real life. And well, mostly coz’ every character was a good looking hunk or a total babe, owning the best closets and being the most popular kids on the block. But then reality finally hit us hard. Basic T-Shirts and flip-flops took over our lives. No mini-skirt wearing teachers, or Quicksilver T-Shirts on the chocolate boy or Alaia shirts on the popular girl. But well for its worth, those characters sure added excitement to the thought of college. We list down 6 of these movies, that shaped our college dreams as fashion extravaganzas. Almost there! In just a day, you’ll officially be experiencing your first day in college. You’ve probably dreamed of this day a zillion times, playing how the day will go, over and over in your head. Stories from older siblings and seniors, books you’ve read as children and of course the movies and shows on college life that you’ve binge-watched, its all adding to the excitement! And while of this seems surreal, here’s a small reality check. You’re probably unprepared for the commotion that college is! From the kind of people you’ll meet to classes and teachers, it might be a little overwhelming.But don’t fret, we give you a few pointers of what not to do on your first day in college.